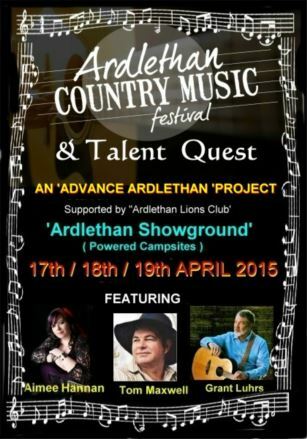 The Ardlethan Country Music Festival Makes its Debut in 2015! Make way – Friday the 17th to Sunday the 19th of April, as steel guitars and cowboy boots roll into Ardlethan for the inaugural Ardlethan Country Music Festival and Talent Quest. It’s kelpie meets country and this brand new event is shaping up to be a must for all country music fans. With top country artists Tom Maxwell and Aimee Hannan performing the main concert event on Saturday the 18th of April. Park your van or pitch a tent at Ardlethan Showground, and kick back for a whole weekend crammed with country. The talent quest, which features an open-mic style singing comp will bring out some of the best hidden talent in the region, competing for cash and prizes like an Acoustic Electric Cutaway Solid Top Guitar badboy, all generously provided by IBANEZ and Custom Music Wagga Wagga. There’ll be market stalls and tasty food on offer, keep warm around the campfires, and enjoy Ardlethan’s good old fashioned country hospitality. If camping’s not your thing, you can always stay in luxury at Ardlethan’s finest - The London Hotel. If you’re heading to the Annual Illabo Country Music Stampede from the 9th to the 12th of April, the Ardlethan Country Music Festival and Talent Quest should be the next thing in your GPS. If you want to join the talent quest, download your entry form here. For more info about camping, what’s on and categories within the talent quest, download the official program here. Held with support from Advance Ardlethan and the Ardlethan Lions Club. The Ardlethan Country Music Festival and Talent Quest is proudly supported by Coolamon Shire Council.